Au coeur du Chianti, situé sur une petite colline et entouré d'un parc de deux hectares avec de belles vues et piscine privée, VILLA Bruschetti et 'une ancienne demeure du 800, qui conserve des meubles et des fresques intactes à l'intérieur, avec un charme très spécial, pour les connaisseurs. We spent one week with several couples in this house, the house is ancient which makes it charm, the rooms are large and there is plenty of space in the house not to feel crowded in spite of being 15 people. The Kitchen is very modern with everything needed to cook. Location is very good, 10 min away from highway and central to Tuscany which makes it very practical to visit Tuscany main touristic places (Florence, Siena, Lucca, Pisa, etc). 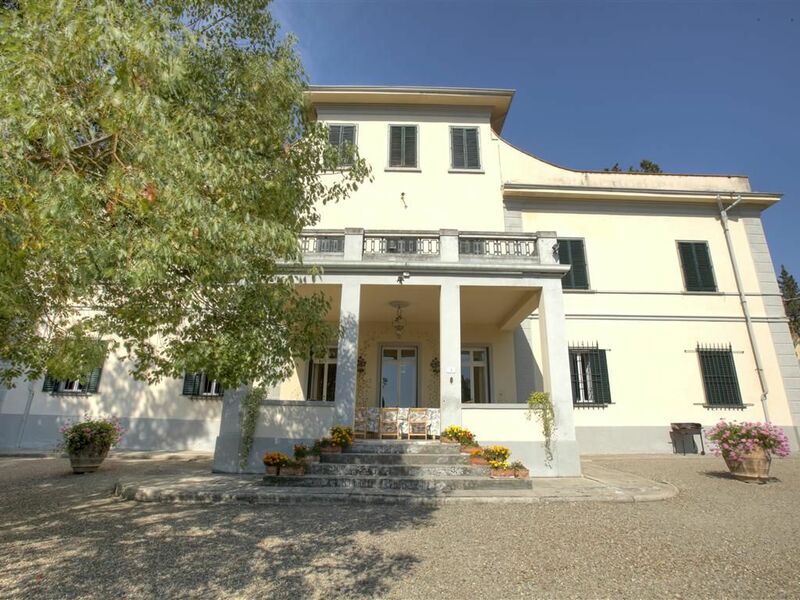 If you prefer to stay the house also offers the best to enjoy ferniente, the pool, bbq, and excellent terrace with views where to taste delicious chianti. Finally, hosts Federica and Alessandra are extremely helpful, we had a couple of extra needs which they helped us solve, to meet them was indeed much of the joy of the stay . Très accueillante, Alessandra est vraiment de bon conseil sur les visites à faire. Elle nous ouvre les portes de sa maison de famille, magnifique, bien équipée (sauf un four micro-ondes hors service), sympathique à vivre et à utiliser pour 15 personnes de tous âges réunies pour fêter l'anniversaire de mariage des grands-parents. La météo fraîche et humide de novembre nous a un peu surpris : sortez couverts. I am so sorry not to meet you!!!! I hope you will come back again!!! Toute la famille a été réunie pour un séjour remarquable. La villa est typique et superbe, très bien située au centre de la Toscane, vaste et confortable avec un très bon accueil de Federica et Alessandra (en Français).Le point de vue sur la campagne est extraordinaire. Grands Parents, enfants et petits enfants gardent de ce séjour un souvenir inoubliable. Great Time in beautiful Villa with very friendly owner. We were 14 People, spending a whole week in this great old lady, Villa bruscette. There was much Space, a wonderful terrace, a nice pool and very kindly owners Francesca and Alexandra. They made our holidays realy great. Want to feel like royalty? Spend a few days in this charming villa! My family (grandparents, sister in law, us and our daughter) spend 9 amazing days in this beautiful villa - we liked to call it our castle. It's like going back in time! The surroundings are beautiful, the villa is very comfortable, the bedrooms and bathrooms are great, the kitchen is very "user-friendly" and the common areas - several places to sit and chat, play, etc - are so welcoming. We loved everything about it! Last but not least, since we were there in the July (super hot time of the year), we took advantage of the pool a lot! Frederica and her daughter Alexandra are very nice and welcoming, and made our stay very easy. We did a lot of day trips to Florence, Sienna, Pisa, the seaside, Ceralto, Vinci - all of these were very accessible, within 30min to 1h driving distance from the house. We would love to come back here one day! Thanks a lot for your beautiful rewieu!!! I would like to have all the guest like you!!! I really like to have you again! Many many beautiful things for you and your bautiful family! See you on the future! Florence, Pise, Volterra <San Geminiano, la région du Chianti Classico, les plages de la Versilia, etc.